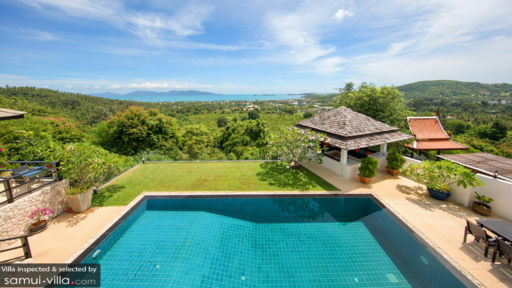 Villa Mullion Cove is a luxurious modern home in Samui’s Bophut region nestled in the mountainside overlooking Phangan Bay to give guests a breathtaking view of the scenic beauty of the island! The villa has been designed to essentially bring you closer to your natural surroundings owing to the skylight in the living room, an infinity-edge swimming pool, an outdoor sala, and bedrooms with personal terraces all to bask in the glorious views. The opulence is evident in each corner and cranny of the villa with Victorian interiors touched with a hint of traditional Thai! Villa Mullion Cove hosts four, well-furnished and air-conditioned bedrooms two at pool level and two upstairs. 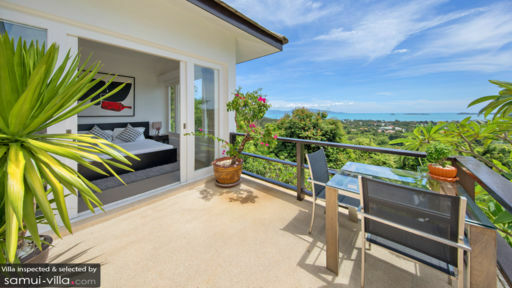 The upstairs bedrooms include the master bedroom with an ensuite that features a glass wall overlooking the stunning view of the mountains and the ocean. There are terraces that provide an even better view of the panorama. The bedrooms are furnished with king beds and a double bed and the ones at pool level provide direct access to the deck. There are en-suite bathrooms attached to each of the four bedrooms for ease and convenience. To will you to spend hours on end lounging about on the pool deck, Villa Mullion Cove offers a well-furnished and well-designed outdoor space complete with a 11 metres infinity pool and sun chairs for you to relax on. Take a nap on the seating found in the open sala that hangs over the cliff, a spot where you get the most spectacular view of the neighbourhood. There is an alfresco dining area with cushioned chairs right on the deck, making it possible for you to enjoy fine dining under the starry-night sky. The terrace upstairs also serves as a great viewing point and guarantees a pleasant experience. Whitewashed walls, built-in bookshelves, indoor plants, and a neutral colour scheme makes the living area a wonderful communal space for everyone to use incessantly. The plushest and most comfortable white couches and sofas are grandly placed facing a flat-screen TV as well as the glass sliding doors that lead to the deck. A second seating is found beside the bookshelf with armchairs and a comfy couch so you can curl up with a book or a magazine while taking in the mesmerizing view. The living room is air-conditioned and is the picture of perfection and calm with its understated interiors. Besides the alfresco dining option, guests can dine indoors as well as there is an eight-seater dining table in the living area so have the luxury to choose where you wish to enjoy your meals. The open kitchen is another swanky and sleek affair with elegant fittings, state-of-the-art appliances and a fully-equipped setup. There is even a breakfast bar with high chairs, perfect for a quick bite or drinks with loved ones! The best part about Villa Mullion Cove, besides the many amenities, is the kind and generous staff who have dedicated their time to look after the needs of guests. From housekeeping to personal guest assistance, you have nothing to worry about since everything is taken care of. For an extra charge, the staff can arrange for private massages or even a personal chef as per request. The villa is perfectly situated in the mountains and yet is not far from Bophut beach where you can view the famous Big Buddha statue. Head to Fisherman’s Village, a historical location converted into a contemporary tourist destination with plenty of bars, cafes, and restaurants. There are numerous restaurants around the area that you can try out as well or you can head to Yogarden for a session or simply to enjoy their beautiful café!